As I depart Mozilla in 2018, I arrive at yet another inflection point in Mozilla’s history. Mozilla is an incredible success story. From $0 in revenue and cash 15 years ago to $500M in both revenue and assets in the latest published annual report(s). From Mitchell’s Vision and Manifesto in the early 2000’s to the launch of Firefox 1.0 in November, 2004, Firefox and everything Mozilla stands for has made an impact on the world. We “Took Back the Web” in 2005 with only a few thousand square feet of space and now have multiple international Mozilla offices with over 1,100 employed Mozillians and thousands of additional open source contributors. It’s been a privilege to have played a part in scaling Mozilla from this 18 person startup to the multi-national, top brand organization we are today. We made an impact on the industry and we continue to be a powerful voice for the web, the technology industry, and operating as a developer community. Mozilla is one of those rare special places where you simultaneously seek to change the world and, by doing so, Mozilla changes you. Mozilla taught me the true meaning of “Open” and how to lead powerfully with both Trust and Transparency. I’ve done my very best to coach/teach other Mozillians these key learning’s and to continuously design these key principles into Mozilla’s “internal operating systems”. There are too many friends and teammates and Mozillians worldwide to thank who won’t see me as often in the offices but who I’ll still be hanging out with on the web and social media sites. In the end, the only thing that matters is we connected with each other, learned from each other, and we made a difference. We learned to trust each other by operating transparently and in turn we learned how a small army of awesome Mozillians could leverage and compete with tech giants. There are so too many stories and so many memories with so many people. The best I can do to convey my experience is to offer a sampling of my “Best Of” in the form of what everyone loves these days “Videos on the Web”! In no particular order and with 100% certainty I’ve missed some important “moments in time”, I offer you my take on “Mozilla’s Best of Vdieos” along with some historical and important blogposts from Mozilla leaders in an attempt to capture and share Mozilla’s amazing history over the last 10+ yrs. There’s a lot below and it may all be tl;dr (too long; didn’t read) for you. If that’s you, then at least BOOKMARK these links in Firefox or for bonus points SAVE the links to Pocket and Share! Thank you Mozilla and all Mozillians! Dewitt Jones is great. A great storyteller with a great message and great photos! p.s. – Don’t forget to bring your “juice camera”! Leadership, though, is a whole other game. Leadership puts the leader on the line. No manual, no rule book, no überleader to point the finger at when things go wrong. If you ask someone for the rule book on how to lead, you’re secretly wishing to be a manager. For anyone wondering what Mozilla has been like over the years, this video explains a ton. Very similar companies. Very similar cultures. For anyone inside of Mozilla, this video will resonate strongly. A Ritual To Read To Each Other…..
A poem…begins as a lump in the throat, a sense of wrong, a homesickness, a lovesickness. It is a reaching-out toward expression; an effort to find fulfillment. A complete poem is one where an emotion finds the thought and the thought finds the words. Robert Frost letter to Louis Untermeyer (1916). and following the wrong god home we may miss our star. storming out to play through the broken dyke. to know what occurs but not recognize the fact. lest the parade of our mutual life get lost in the dark. should be clear: the darkness around us is deep. To get so we had no one left to live with. For to be social is to be forgiving. The best I can offer is to try to help everyone remember Mozilla’s roots and to remind everyone that a company builds its culture everyday. Mozilla has always built our culture the way we build our software – open source and transparently (view source). to Reid’s reminder today to “Let’s not waste a good crisis”. Now is the time to double down on everything that’s great about Mozilla. Now, more than ever, is the time to show the world WHO Mozilla is, WHY we exist, and HOW we operate. Now is the time to lean in hard. As Churchill said,“If you are going through hell, keep going”. Or you may prefer Robert Frost version “the best way out is always through”. “It’s the People”: People create culture from a shared purpose, values and behaviors. Mozilla creates space for people’s “best of”. This environment in turn attracts more talent and the upward spiral of knowing more, doing more, and being better. Capacity and Willingness to Connect with Others Deeply. Showing Up, Digging In, and Being Yourself. LEADERSHIP is not a title and it’s not management it’s a BEHAVIOR….anyone can exhibit it. We model courage or cowardice and leadership everyday. Every time we show up and/or FAIL to show up. Every time we use our voice. Please turn to the Mozillian next to you…and let’s begin again. I’ve had drafts of this very topic (Trust Can Scale) and (Trust Requires Transparency) in various forms throughout the years (emails, notes, discussions with various Mozilla employees/ execs and industry panel presentations). Last weekend, I woke up and during my normal routine (coffee, scanning Twitter) I stumbled upon another classic @bfeld post that nails the concept better than I’ve ever written or spoken it. Thanks Brad for finally inspiring this post! Mozilla has been operating this way for years. We don’t know how to do it differently. Yes, Brad, we are now a +700 person company and yes, it absolutely still works! I’m known inside Mozilla for being emphatic about “Optimizing for efficiency and productivity”. You’ll rarely hear me leading with “optimizing for cost” or with financial requirements. In the rare cases I have tried leading with money/cost only guidelines, it has backfired with unintended results of severe inefficiency (needs another post). We absolutely optimize for self-direction and the ability for every employee to make balanced and quality decisions. And yes, that requires optimizing around Trust! Trust in these systems doesn’t mean lack of control. Quite the opposite actually. We absolutely “Trust AND Verify”. In Egencia (and many other of our cloud based self-managed systems), we build all the classic controls and signature approval policies inside each system. And like any other more traditional policy, we allow exceptions which are also recorded inside each system (Transparent Exceptions). Then, we let our employees simply use the system to manage their own time, their own travel, their own business needs. 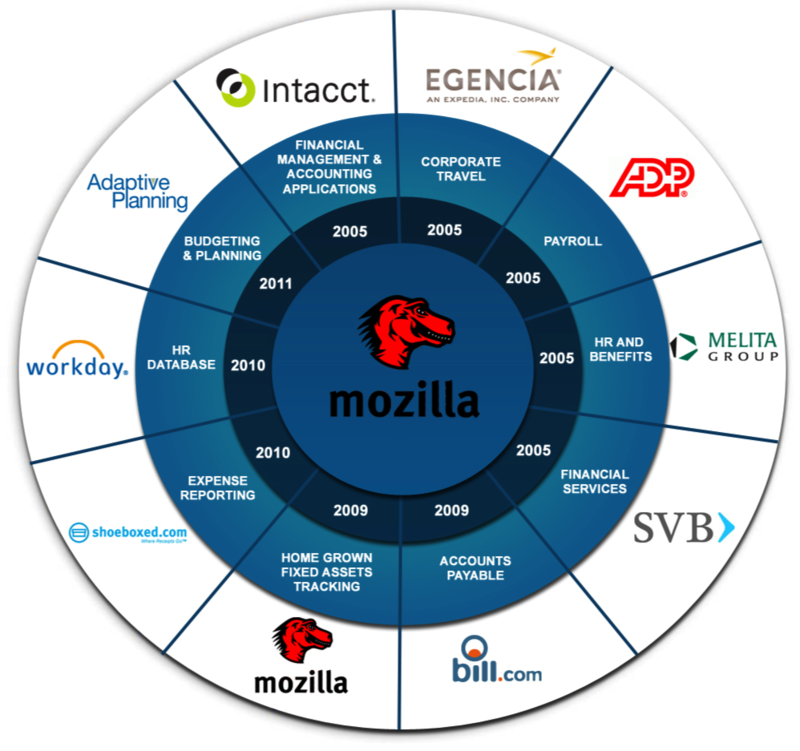 A look at most of Mozilla’s systems below. Nearly all are “cloud based” and most have a self-directed component allowing management and finance to get out-of-the-way. 93% were issued via self-service online – no agent/human needed. 28 days Avg Advanced Purchased – Awesome; we are planning trips better! ; this used to be bordering on the all critical 14 days. Avg. rate of $205 per night. We don’t drive nearly as much; Only 1400 car rentals in CY 2012 x $39 per day avg. = $56,000 Total Car rentals in CY 2012; Keep mass transporting! Which brings me to another key concept inside Mozilla. Trust requires Transparency. Mozilla does transparency very well. Transparency includes building in complete click-through audit trails into all of our systems that easily shows who did what and when. When you have such trusted systems and transparent systems, there’s literally nowhere to hide. Transparency is the rather simple act of showing your work. Communicating openly what you did and why. Being accountable for your actions and saying “your right, I missed that” or “good catch, let’s fix that”. Transparency means being able to defend your decisions. Transparency is also the most efficient way of inherently teaching as you go. That’s it. I’d recommend anyone uncomfortable with this transparency concept to get used to it…fast. The younger generations always plant and grow the seeds of cultural change. Our younger generations are beginning to lead more of our most exciting companies and their underlying cultures. This “information everywhere generation” and “digital youth” have grown up with a natural ability to parse amazing amounts of information to get to the core of most issues quickly. They are also naturally collaborative and expect everyone else to share and solve. Since information is virtually free, they compete and differentiate by developing unique solutions from the shared knowledge pools. Ultimately, Transparency breeds Trust and very powerful Teams. Does this new process help us go faster? Does this new process help us be more efficient? Trust could be one of your most valuable company assets. As a leader, you need to fight like hell to protect it. If you are successful protecting trust, you’ll actually grow much faster and you’ll still have a place where people love working. And another great post on “Process” that recently made its rounds around Mozilla to wide acclaim. There is a fast growing movement underway in Silicon Valley changing an ancient stock option practice (ancient in Silicon Valley terms) which originally helped build VC backed startups but is now so outdated and misaligned with modern day private company times that Mgt teams/Boards across the Valley are mostly quietly changing the exercise periods of stock options board meeting by Board meeting. The acronym is PTEP or Post Termination Exercise Period for Stock Option holders (primarily employees of private VC backed companies. The issue is a forced 90 day exercise period once an employee decides to leave their company. If an employee can’t afford to pay the Stock Option exercise price + the taxes on any gains, the option which has been vested and earned by the employee is forfeited. The crisis at hand is the unarguable facts that private companies are staying private much longer and valuations are soaring creating a huge economic disadvantage that greatly misaligns the original intentions of stock options as well as the meritocracy value systems that most leaders espouse. In essence, we have a situation where the wealthy who can afford to exercise these options after 90 days have the opportunity to get more wealthy and vice versa. I’ve been personally involved in much of this discussion from Board rooms to Panel Talks to private COO and CFO web/email groups. I’ve recently posted my views to a few of these groups and have received such overwhelming agreement from peer CEOs, COOs, CFOs that it’s time to publish here as well to ensure the strong chorus is amplified. Bottom Line: Stock Option times are a changing and it’s time to change with the times and be part of the leadership of creating a healthier economic reality for employees. The private markets are catching up to ancient and outdated stock option practices. Huge misalignment of fair compensation practices with regards to stock options. The Problems in these stale practices are clear. The Avg Private company is now staying private for 12 yrs (latest data). 30 years ago, the average was 4 yrs. $100K ISO Exercise Limit has not changed with Inflation….should be in the $300-$400K range in today’s dollars. Stock Option exercise prices used to be pennies or tens of cents. Finally, the topic here, 90 days to exercise is so MISALIGNED, it remains the only form of compensation that can effectively be TAKEN BACK by those in power and with much deeper pockets. To set the facts straight, when the discussion is about extending the stock option exercise period, we are dealing ONLY with Vested Stock Options. Stepping back and asking “What’s the Right Thing To Do Here?”, there is generally a failure to recognize that Vested Stock Options are “Earned Compensation”. The employee worked “Sweat Equity” and typically took lower cash pay as part of their overall comp package. And yet, how can it be that “Earned Compensation” can be swiftly taken back within 90 Days? The party with the power says there’s a catch! You are required to pay me a large % of the value of what you’ve earned (30-50% taxes) before I pay you your earnings? You don’t have the cash to pay me before I pay you? Too bad, I get to put those earnings back into my pocket? Can anyone imaging treating other forms of earned compensation this way? Your annual bonus? Your annual commission? Imagine being forced to pay the taxes on your annual bonus or commission upfront before the company pays you the actual bonus cash? To add insult, imagine a company or board saying “If you can’t pay the taxes, you lose your bonus” and that gives us the opportunity to pay higher bonuses to others? As ridiculous as that sounds, it’s exactly the practice that’s going on with stock options. When framed this way, people should be up in arms about this practice especially with the complete lack of changes in the private marketplace now that companies are staying private longer, stock option prices (409a valuations) are the competition for attracting and retaining talent has never been higher. So, in classic market condition corrections, there are now nearly 100 brand name private VC backed companies that have been proactive and have changed these ancient practices. The rest of the Private markets will follow sooner or later once they realize this is actually both a new retention tool and an alignment of interests tool. Extending exercise periods once a valuable employee hits 2 or 3 yrs and then extends a year for every year of service thereafter up to say 7 years is another retention tool not much different than “Refresh Grants”. In the end, company’s, Boards, VC’s should never argue that they are “giving something” to these employees. These employees EARNED this value by providing their valuable services to the company. An employee shouldn’t have to be wealthy to acquire the value they’ve earned and certainly shouldn’t have this value taken away due to lack of affordability. NEXT STEPS: For those involved in a position to change your companies practices here, so your homework. 1) Read these links and others. 3) Draft and propose the proper changes for your company to your Board. This is long overdue…..it’s time to show leadership again in this very important compensation area. When you are 92 and you have life experiences like Brother David Steindl-Rast, I always listen. A simple and wonderful message on a Sunday. * Stop, Look, Listen, GO! If you liked that 2007 video, he updated it in 2017. Same message but worth watching again!